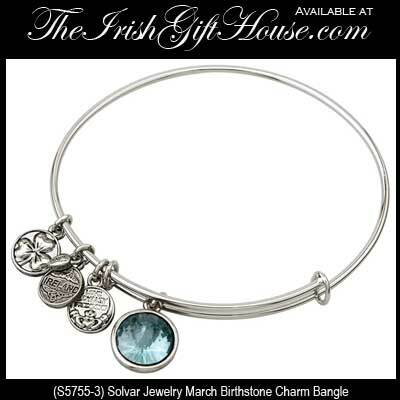 This rhodium plated Celtic bracelet is an expandable wire bangle that features a resin aquamarine birthstone charm for March that measures 1/2" diameter and is enhanced with a Trinity knot on the reverse side. 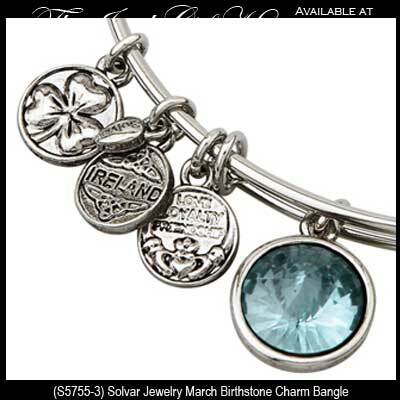 The Celtic birthstone bracelet also includes 3/8" diameter Claddagh, shamrock and Ireland charms with the Claddagh design featuring the words, Friendship, Loyalty and Love, and the Ireland charm featuring knot-work. 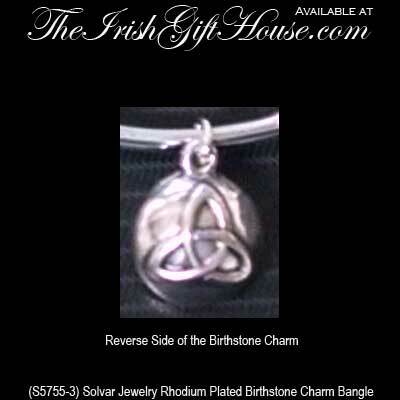 This Celtic wire bracelet is crafted by Solvar Jewelry in Dublin, Ireland and it is gift boxed with the respective symbols' history card, complements of The Irish Gift House.